Learn vocabulary and grammar structures related to everyday actions. The game allows players to use regular and irregular verbs in the present, past and future tenses. 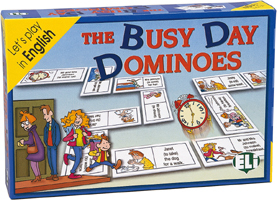 Each domino has an illustrated action and a written phrase. Following the rules of dominoes, players match the pieces together. The teacher can decide which grammar tense to use and can thus change the level of difficulty.